First Novels Club: Laurie Faria Stolarz: Guest Post and BIG Contests! 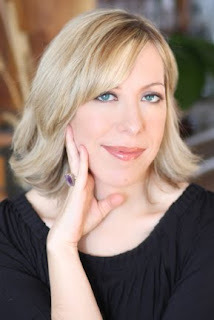 Laurie Faria Stolarz: Guest Post and BIG Contests! Hi Laurie, welcome to the FNC! Thank you so much for spending time with us today! Thanks so much for inviting me to talk here about the BLACK IS FOR BEGINNINGS, the fifth book in the BLUE IS FOR NIGHTMARES series, and the upcoming release of DEADLY LITTLE LIES, the second book in the TOUCH series. 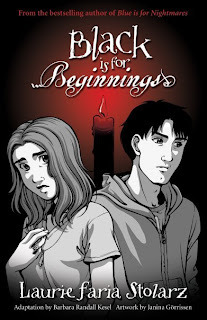 BLACK IS FOR BEGINNINGS is a companion book to the BLUE IS FOR NIGHTMARES series. When my editor approached me with the idea of writing a graphic novel, I was very intrigued because it gave me the opportunity to not only try something new, but to really picture the book as a movie. I have a background in screenwriting and wrote BLACK IS FOR BEGINNINGS in screenplay format, adding in ideas for illustrations and sidebars. It was an absolute thrill to write, and to have the opportunity to work with an illustrator for these characters and situations I’d created. BLACK IS FOR BEGINNINGS does not take the place of a regular prose novel in the series. It is a companion piece, complimenting the entire series as a whole. It picks up where RED IS FOR REMEMBRANCE left off, and also shows some fan-favorite scenes from the entire series. DEADLY LITTLE LIES is the sequel to DEADLY LITTLE SECRET, (the first book in the TOUCH series). I’m really excited about it, because I think it has even more suspense, romance, and twists than the first book. It starts up a few months after (Spoiler Alert) Ben’s departure at the end of DEADLY LITTLE SECRET. Camelia’s spent those months researching everything she can find on psychometry (the ability to sense through touch). See the full description below. Below, you’ll find Stacey Brown’s courage sachet spell, Camelia’s favorite psychometry links, and some tips Camelia has to develop your psychometric powers. I’m also including some random facts about me. Lastly, the paperback of DEADLY LITTLE SECRET will be out in November as well. For a limited time Barnes & Noble will be releasing an exclusive edition that will have excerpts from Ben’s secret blog. Many thanks again for this opportunity to chat! Be sure to visit my website, where you’ll find more contests under NEWS, and information about upcoming signings (www.lauriestolarz.com). 1. I love what I do, and feel very grateful to be able to have this as a career. 2. I love dark chocolate, Starbucks coffee, Bertucci’s cheeseless pizza, popcorn, and Indian food (though not necessarily in one meal). 3. I watch an embarrassing amount of reality TV (it’s research after all). 4. I’m very deadline driven, giving myself weekly deadlines and agendas, so that everything gets done on time. 5. I have a background in marketing and French. 6. My first job was as a piano teacher (I was 9). I’ve also been a waitress, a supermarket cashier, worked in a ceramics studio, worked as a tour guide for international exchange students, been a teacher, a script reader, an editor, and written obituaries for a newspaper. 7. I’m a vegetarian. If I were to try my hand at a different career, it would be holistic nutritionist. 8. I love yoga, dance/aerobics classes, cooking, tennis, and power walks. 9. I often shop online, fill my basket, and then empty it all out. Does anyone else do this? 10. My readers mean the world to me. Thanks so much for stopping by Laurie! And...the FNC has some exciting contest news for you! After you finish entering Laurie's contests, enter ours! Leave a comment below and enter for a chance to win one of five prizes! Here's how to enter: You must be a follower and leave a comment below. +1 for everytime you repost. So for example if you run two blogs and post on both of them (+2). Or if you repost on your blog, twitter and facebook (+3). Please leave your email address and links to the reposts. Contest runs until 10/31 at 11:59PM EST. (Also check out our other October contest STALKERS and SERIAL KILLERS). This is a fascinating post. I think that the concepts here are under-utilized. And, as with the other post y'all did--I totally agree. Stalkers/serial killers are MUCH scarier than vampires and zombies!!! Wow this is an amazing contest! Very creative! Great giveaway. 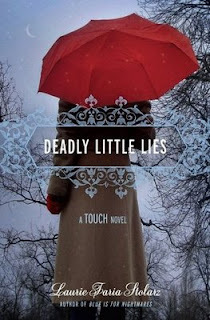 I can't wait to read deadly little lies. I'm a follower and would love to be entered in the contest! I've never heard of these books but now they're on my list! I don't know if we can indicate a preference but mine is Deadly Little Secret (although I would be thrilled to win any of the books). Thanks for the contest! Great contest. I have just become a follower. I've read a couple of Laurie's books (Blue is for Nightmares and White is for Magic). Very cool stuff thanks for all the wonderful information & life tools!!! +3 I posted this on my blog Right in front with pictures ;o) Thanks for this chance to win these amazing books!!! I posted this on my blog as you can see above in my entry. So there you have it.....so you can go on over and see the post!!! Great guest post! Ohh and she's a vegetarian too, that's awesome. I sometimes do that too (#9 random fact) I fill up the trolley with lots of cool stuff I want and pretend I'm a super-rich little munchkin and can afford it all... then regrettably empty it all out when I decide play time is over LOL. Awesome contest, I would love to be entered please! I would absolutely love to be entered! I haven't read any of Laurie Faria Stolarz's books yet - but they all sound simply amazing! Please enter me! I've already read Deadly Little Secret and I can't wait to read the next one! Great contest! I am a follower. I'm a follower and I posted about this on my sidebar and on twitter. Thanks for the contest. I'm a follower. Awesome Contest! I am a follower. This sounds like an absolutely awesome contest with some spectacular books! Please enter me. I would love to be entered. I am a follower. I'd love to win one of those! Count me in. I'm a follower. I've been wanting to read these books for awhile. I just love all of her books. I think she is a fabulous writer! Please enter me in. I love Laurie's books! She's such a good author!!!! I would love to win any of these books! Thank you for the giveaway.